Rhinocerebral mucormycosis occurs most commonly in patients with uncontrolled diabetes, especially after an episode of diabetic ketoacidosis. It may also occur in leukemic patients who have had prolonged neutropenia and therapy with broad-spectrum antibiotics and occasionally in organ transplant recipients. The earliest symptoms in rhinocerebral mucormycosis are facial pain, headache, and nasal stuffiness. As the disease progresses, orbital pain and facial anesthesia may be noted. Double vision or loss of vision may develop after invasion of the orbit by the rapidly spreading infection. Mental status changes herald the penetration into the brain with ensuing cavernous sinus thrombosis, carotid artery thrombosis, and cerebral abscess formation. Serial cranial nerve abnormalities, especially of nerves 5 and 7, can occur. Physical findings include proptosis of the globe and loss of extraocular movement as orbital involvement progresses. Inspection of the nares may reveal black necrotic tissue indicative of angioinvasion and necrosis. A black eschar on the hard palate is a hallmark of mucormycosis. There are no typical laboratory abnormalities associated with the condition except as noted above. The onset of symptoms may occur during the recovery phase of diabetic ketoacidosis. Most leukemic patients that develop this syndrome do so while still profoundly neutropenic. Cultures of nasal secretions or biopsy specimens are commonly negative even when hyphal elements are present. X-rays of the sinuses are generally insensitive but will demonstrate opacification of one or more sinuses. CT imaging or MRI is an essential part of the evaluation. Bony destruction can be found where disease has extended into the orbit, the mouth, or the central nervous system. Few other conditions are able to produce the syndrome of rhinocerebral mucormycosis in the appropriate patient population. Invasive Aspergillus or Fusarium sinusitis may cause a similar syndrome, particularly in the neutropenic leukemic patient. 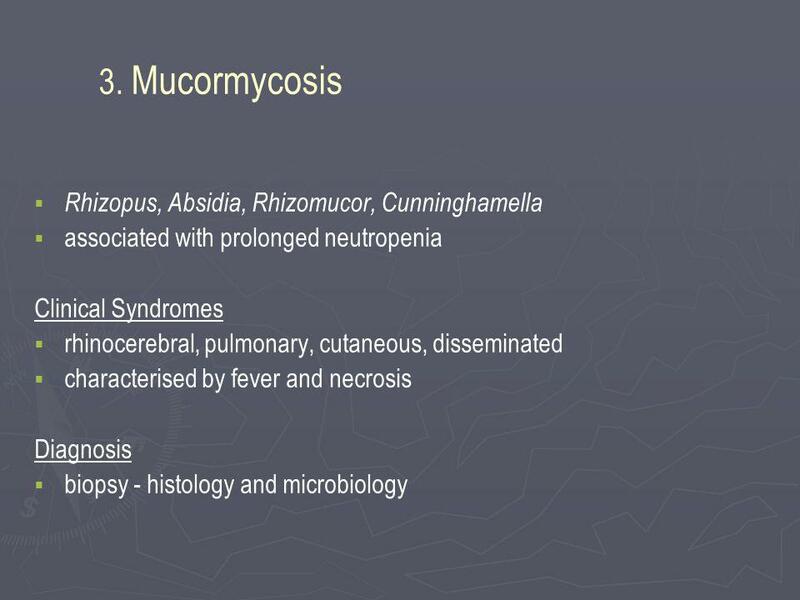 Pulmonary mucormycosis occurs most commonly in patients with prolonged neutropenia due to chemotherapy for the treatment of leukemia or malignancy. Most of the patients have had antecedent prolonged courses of broad-spectrum antibiotics. It occurs less commonly in diabetic patients and tends to be less fulminant in this setting. The onset of symptoms may be subacute to acute to fulminant. Most patients are critically ill and toxic appearing. Respiratory localization is evident based on the common occurrence of cough and shortness of breath. Pleuritic pain and hemoptysis are common. Fever is usually present and may have an abrupt spiking onset. Physical findings may be absent or reflect focal pulmonary infection. Hypoxemia may be present depending on the extent of pulmonary involvement. Sputum cultures may grow an agent of mucormycosis or may be negative. Chest x-ray may reveal unifocal or multifocal infiltrates or nodules. As the disease progresses, cavitation is very common. Mucormycosis may simulate other opportunistic fungal infections involving the lung such as invasive pulmonary aspergillosis. At the onset of symptoms, pulmonary mucormycosis can resemble pulmonary embolization caused by the presence of dyspnea, hemoptysis, and pleuritic chest pain. Hematogenous dissemination of infection, particularly in the fulminant form of disease is common. Frequent sites of dissemination include the central nervous system, gastrointestinal tract, spleen, kidneys, heart, and liver. Fulminant disease is almost uniformly fatal, and patients rarely survive > 2 weeks. Mucormycosis endocarditis is a rare infection that occurs in patients with prosthetic valves. Most of the symptoms are caused by embolization from the large valvular vegetations that form. Valve replacement surgery can be curative. Gastrointestinal mucormycosis develops in patients with profound malnutrition. Involvement of multiple sites in the gastrointestinal tract is seen. Abdominal pain and fever are the usual symptoms. Cutaneous mucormycosis can occur by direct inoculation of the skin in patients with burns, diabetes mellitus, or trauma. The skin may also be a sight of hematogenous dissemination. Hemodialysis patients receiving desferoxamine therapy for aluminum overload are at increased risk for any form of mucormycosis caused by Rhizopus spp. The diagnosis of mucormycosis usually requires demonstration of the organism in biopsy specimens. In the rhinocerebral form of mucormycosis, nasal specimens are usually satisfactory for establishing the diagnosis. The tendency to angioinvasion and tissue necrosis often produces a black eschar that should suggest a diagnosis from physical findings. Open lung biopsy may be necessary to establish the premortem diagnosis of pulmonary mucormycosis in the absence of sites of hematogenous dissemination that may be sampled. In general, the full-blown clinical syndrome in the appropriate host should suggest the diagnosis. It requires a high index of suspicion in the early stages of infection. Culture of infected material may be negative, but staining of biopsy specimens can show abundant angioinvasive hyphal elements, suggesting the diagnosis. 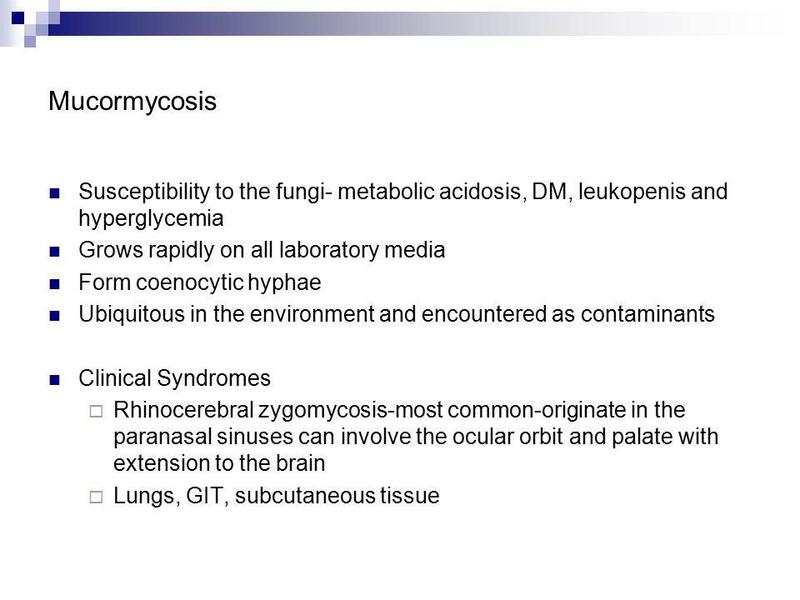 Once the diagnosis of mucormycosis has been established, the initial approach to therapy should be to correct aggressively any predisposing factors (see Box 5). In patients with diabetic ketoacidosis or hyperglycemia, metabolic abnormalities need to be corrected and controlled. Patients receiving immunosuppressive therapy, especially corticosteroids, should have this reduced as much as possible. Antifungal therapy should be instituted with amphotericin B. The duration of therapy should be based on clinical response. The available azoles do not appear to be effective against the agents of mucormycosis. The newer liposomal preparations of amphotericin B are attractive alternatives to standard amphotericin B because of their reduced nephrotoxicity, although they are no more effective than the standard preparation. Amphotericin B toxicity is high in patients with mucormycosis because of the high dose required and underlying patient conditions. In the rhinocerebral form of mucormycosis, aggressive debridement of the involved sinuses, enucleation, and extensive orbital debridement may be necessary. Some patients will require serial debridements that can be quite disfiguring but may improve their chances for survival. Cutaneous mucormycosis should also be aggressively debrided. 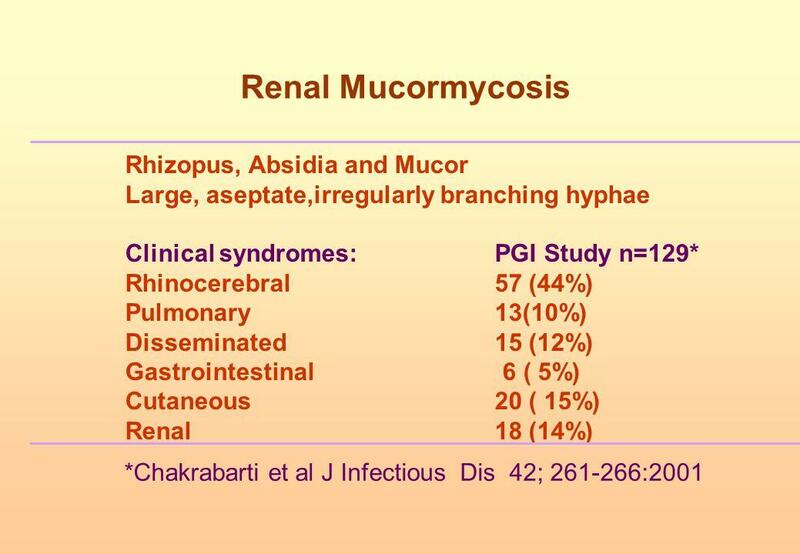 Patients with pulmonary mucormycosis, gastrointestinal mucormycosis, or disseminated disease rarely survive. Rhinocerebral infection also has a poor prognosis but with early diagnosis and aggressive surgical and antifungal therapy, survivors have been reported. Fortunately, mucormycosis is rare. There are no proven preventative or prophylactic strategies. Because it is a relatively ubiquitous spore-transmitted fungal infection, many of the strategies used to prevent transmission of Aspergillus spp. may be effective in reducing the transmission of the agents of mucormycosis. It is unknown whether antifungal prophylaxis has any impact on the incidence of mucormycosis.